For the tourists visiting any foreign country, it is always a question where to have a quick and safe snack. Of course, in any country there are lots of good restaurants offering varied and exquisite dishes, but the prices there are not low, and not always you have enough time or can afford eating there. 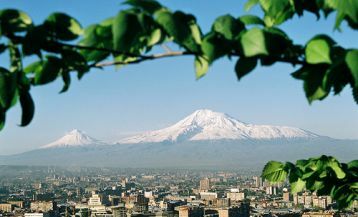 Fortunately, Armenia is one of those countries, which has much to offer in this case. Cafes, offering fast-food or places with street food are situated throughout the capital, and most importantly, many of them have delicious safe food and good service. Arara Tour presents the most popular fast-food places, which correspond to high standards and would be interesting for any tourists. The center of the capital is the most popular place offering delicious fast-food. 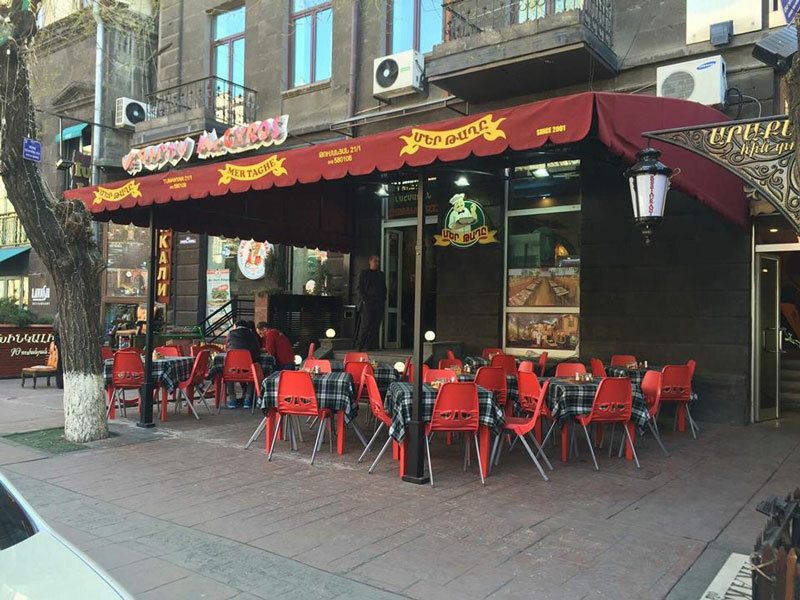 One of the famous streets is Tumanyan Street where you can find fast- food for any taste. Fans of shaurma can hardily go there and enjoy their favorite dish (by the way, it is important to note that according to the opinion of many tourists, Yerevan offers one of the most delicious kinds of shaurma). If you ask any passer whether he knows Tumanyan Shaurma restaurant (Tumanyan 32), he will surely give an affirmative answer and will immediately show the way. That’s because this place is very claimed and well-known. You can eat here at the stands or at tables; those who wish can also pick the order and eat, for example, in the park. The restaurant offers traditional shaurma with chicken, beef, with addition of various vegetables (cabbage, carrot, beans, eggplants, pepper grill). The price of this shaurma varies from 750 to 950 AMD ($ 1.6-2). Here you can also order kebabs, iki bir, barbecue and various refreshments. Iki Bir is very well prepared and delicious, it will cost from 750 to 1,150 AMD, which depends on the size and the type of ordered meat. The only minus is that you will have to wait for about 15 minutes until the meat is ready, and it is not very convenient for those who are in a hurry. (The branches of this cafe can also be found on Komitas Str. 50/50, Mantashyan Str. 28/4). It must also be noted that right next to “Tumanyan Shaurma” you can see a small stand offering hot and favorable pancakes. This little place is called “Crepes” and here you can find only delicious pancakes and nothing else. Optionally, you can ask to add toppings, such as apples, bananas, honey or Nutella. Each filling has its own price. This “cafe” is simply a rack and there is no place to sit here. 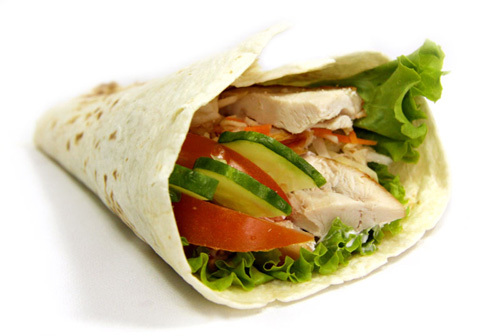 The other quite popular place is the restaurant Mr. Gyros – a Greek fast-food chain. The main dish of the restaurant is “Gyros”, which is very similar to shaurma. The prices on this dish vary from 650 to 1200 AMD ($ 1,35 – 3,5), which depends on the type of meet you prefer and the size. Here you can choose either chicken, pork or beef. The dish is served with fresh vegetables, French fries, and sauce. However, that’s not all, the restaurant also offers various sandwiches and salads as a garnish. For the dessert, you will find extremely delicious ice-cream drizzled with hot sauce (strawberry, chocolate, caramel), or Greek pie with cinnamon – Kanelopita. The atmosphere and the interior are pleasant and cozy, everything is painted in white and red colors, and walls are covered with pictures representing beautiful corners of Greece. For those who are with children, there is a kid’s playground. (Mr. Gyros can be found at Tumanyan 21/1, Tumanyan 40, Komitas 56/9, Mashtots 5, Teryan 62a). Almost next to Mr. Gyros you can see an interesting snack-bar “Berliner Hot dog”, that offers hot-dogs with sausages brought from Germany. The place is not very big, however, it’s very cozy. There are no many visitors here, probably, because the place hasn’t gained enough popularity yet, or, perhaps, because of the prices, which are not very low due to the use of high quality products. Among dishes, you will find here only hot-dogs, but the choice is rather big. The prices start from 500 AMD for classic hot-dog and end with 1.900 AMD for a large-sized “Giant hot dog Berliner” ($ 1 – 4). The most delicious is considered hot-dog “Nuremberg” prepared with a sausage, fried on a grill ($2). 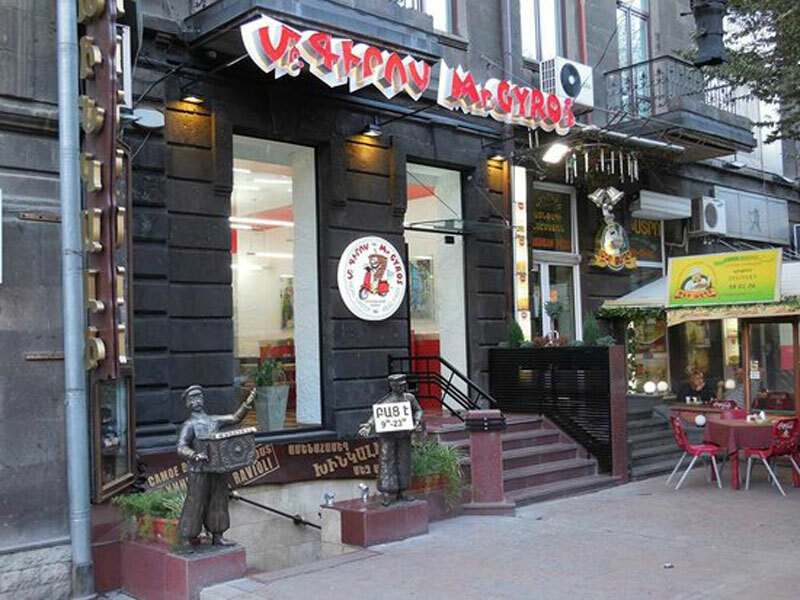 On the same street (Tumanyan 21) you can find a very popular eatery “Mer Tagh”, which is translated as “our yard”. 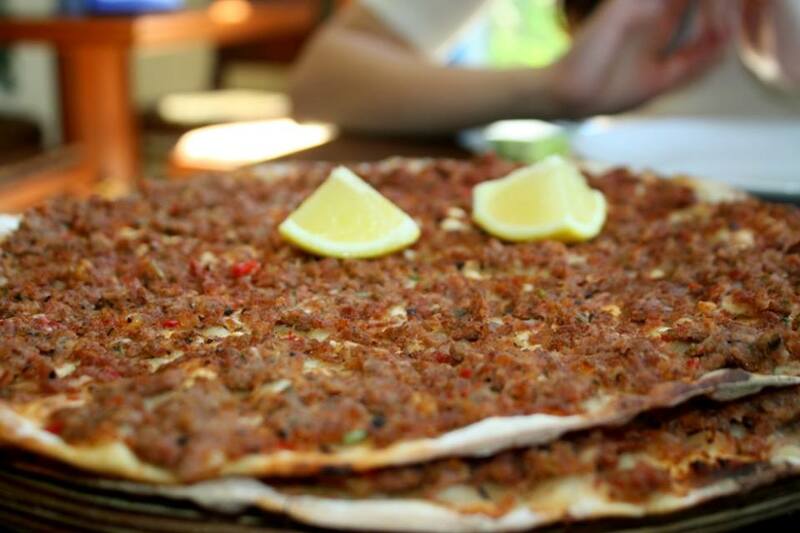 This place is mainly visited because of its tasty lahmajoon – thin dough covered with minced meat and fried in an oven. “Mer Tagh” will not surprise you with an exquisite interior or various dishes. However, lahmajoon here is so tasty, juicy and at the same time crisp, that the place gained wide popularity. The service is so quick, that you have to just make an order – and your freshly baked lahmajoon with lemon slices will be on your plate! Some people even buy lahmajoon in a special package and take it with them. According to the waiter, after freezing this luxury can be taken even to Europe and Russia for entertaining family and friends. One piece will cost about 720 AMD ($ 1.5). Generally one can take 2 lahmajoon to feel satisfied. The eatery also offers fast-food, but it is not so popular. 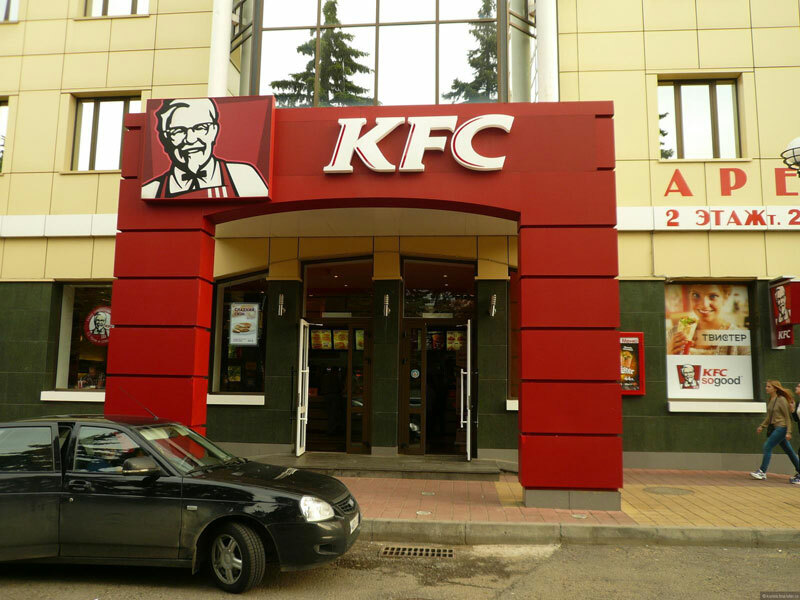 You will not find well-known fast-food McDonald’s restaurants in Armenia, but there is a quite popular chain of catering cafes – KFC (Kentucky Fried Chicken), which specializes only in chicken dishes. The variants of sandwiches here are more than enough, all of them are with chicken, but the toppings and sauces differ. As a side dish you can have french fries or “Cezar” salad, or you can order snack box where fries are already included. For the dessert KFC, offers a cheesecake and chocolate or fruit muffins. The prices here are not very low but not very high. They start with 700 AMD, and the most expensive “Bigger” costs 1600 AMD ($ 1,45-3,3). The menu also offers ”baskets” with chicken wings, which cost 5000 AMD ($ 10). So for those who wish to have a quick snack this place is perfect. The interior is very nice: red chairs and sofas, original painted walls, large plasma TVs. 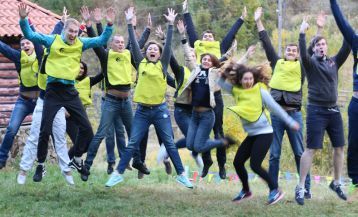 And the restaurants are located at the following addresses: Mashtots 40/3, 17/3 Moskovian, Tigran Mets 15, North Avenue 1. The perfect choice for those who wish to have quick meal will be Karas restaurant, which can be found in different corners of the capital. 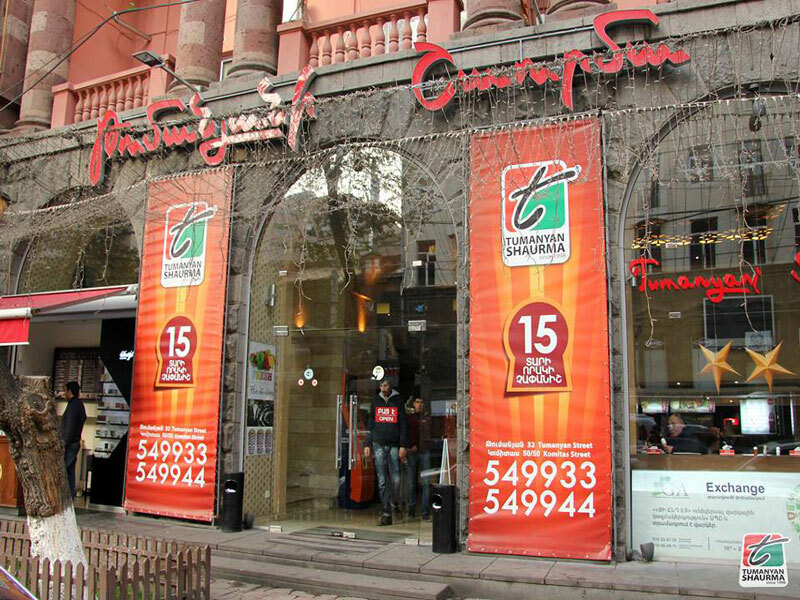 This restaurant was opened in Armenia in 2005, and now there are about 11 service branches. Here, at low prices, you can taste both national dishes and fast food. Those who are in a hurry can order fast-food, which is various enough: burgers and pies, sandwiches, hot dogs and pizza. 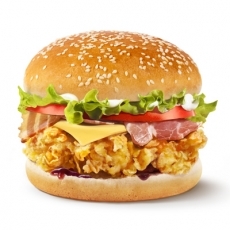 Prices for fast food start from 250 AMD for one pie ($ 0.5) and end with 850 AMD for a burger with beef ($ 1.7). And the choice of barbecue is really surprising. Here you can find not only traditional pork or beef barbecue, but also barbecue prepared of beef tongue, lung, and heart, barbecue of lamb, chicken, rabbit, and fish. The prices vary according to the selected meat and the portion size. The cafe is open around the clock and perfectly corresponds to the needs of the modern metropolis. Here you can also arrange business meetings or just enjoy spending time with family and friends. The word “ponchikanots” can be translated as “the place with donuts”. Ponchikanots is situated not far from Matenadaran Museum (Mashtots ave. 54) and is considered a very special and favorite place in the city. That’s because here you can taste very delicious, hot donuts with vanilla and chocolate filling. 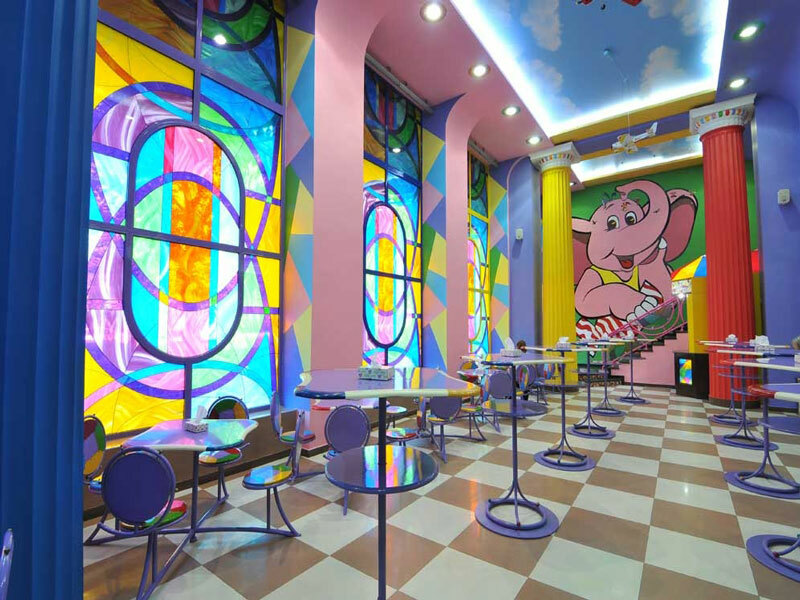 This café opened many years ago, and now it belongs to Grand Candy Company – one of the largest and most famous in the production of confectionery products. Entering the café, you will immediately get into cozy, cheerful and even childish atmosphere: the ceiling is decorated with clouds and flying miniature airplanes, the hall is decorated with colorful Greek columns. 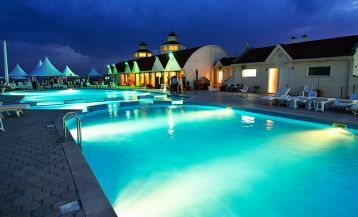 This place will be perfect for those who want to spend good time with their children. By the way, Ponchikanots also offers various cakes and ice-cream, but people come here mostly to have donuts. One donut with vanilla cream will cost only 100 AMD ($ 0,10), and with chocolate cream – 150 ($ 0.30). Donuts are ideally combined with hot cacao, which can be ordered only for 150 AMD ($ 0.30). Those who doesn’t have time to sit in a café, can take donuts with them and eat wherever and whenever will be convenient. “Artashi Mot” is a quite popular Armenian restaurant offering fast-food. It is located on Moskovyan Str. 31. The menu here is quite various for the fast-food restaurant. Of course, here you will find Armenians favorite shaurma, however, it is prepared here without any sauces, only with fresh vegetables. So in the end you get a delicious shaurma, where nothing interrupts the taste of meat. It costs about 750 drams ($ 1.5). You can also find here barbecue and kebab, which are not quickly prepared, but are all-in-all included into the menu. 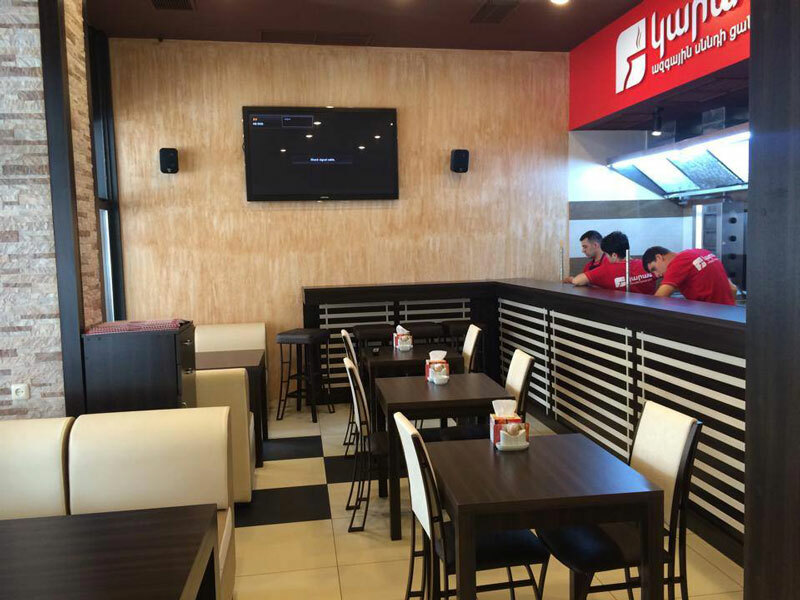 Kebab here costs 700-800 AMD ($ 1,4-1,6), and barbecue – 1200-3000 AMD ($2,5-6,25).